In my real life I’ve been doing some light plumbing work and drywall repair over the past week. I wanted to move the water line running to our fridge from a hole in the floor to a wall box installed behind the refrigerator. For me the job was new territory – I’ve never worked with water lines nor have I done drywall repair. Luckily, the job was manageable enough even with a 2 year old running around the house every step of the way. The job however got me thinking about my coffee maker. I have been a big fan of french press coffee and the moka pot (stove top espresso) over the past month and a half or so but after giving my coffee maker a very thorough cleaning it has been tempting to use it more frequently for those times when I don’t want to go through the trouble of setup or cleanup. I basically envisioned a drip coffee pot that was plumbed with filtered water so that I wouldn’t have to fill the reservoir up ever again. Just drop in a coffee filter and a few scoops of coffee and hit start. Wouldn’t you know it there are such things and you can even build your coffee maker straight into the wall just like you would a recessed box for your fridge or washing machine. A while back I posted this short list of quality coffee makers that can accept a water line hookup but and these are cool and all but they do take up counter space. 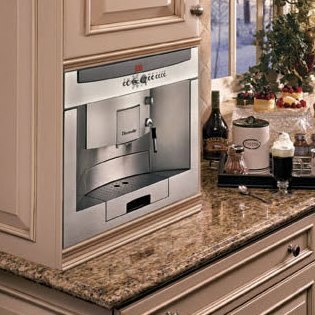 Since a complete novice like myself just framed and built a new wall box for my ice maker I figure most people (if the will is there) could probably do the same with a coffee maker. If money is not an issue, I’d gladly spend $3000 to get a built-in-wall coffee maker. Just imagining its stainless steel, shiny finish installed in my kitchen, I already feel excited to make coffee. It’s like having a personal barista at home or installing a mini coffee shop right in your kitchen. How does the built-in-wall coffee maker work? The built-in-wall coffee maker has really cool features that will make any coffee lover drool. It has a built in grinder. You can control the type of coffee ground you like. Most built-in-wall coffee makers can yield espresso. Just push the appropriate button and it will grind the beans to your liking. Modern coffee makers like the built-in-wall type is very intuitive. It is designed to provide several options depending on your preference. 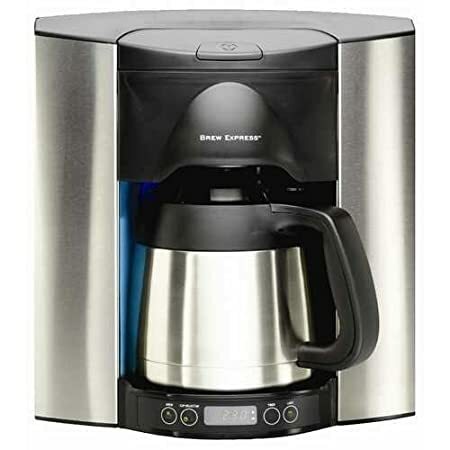 You can set it to make a single cup of espresso, brewed coffee or long coffee. If you prefer to make two cups, you can choose the “two options” icon, often indicated by two cups. This will allow the machine to make coffee good for two cups, dispensed at the same time. Just place two cups underneath the dispenser. Some built-in-wall have options for multiple servings. It is often indicated by a coffee pot icon. It will ask you how many cups you need. Choose the number of cups (3 to 8 cups) and place a container to collect the coffee from the dispenser. If you love latte, cappuccino and other drinks with milk, you will surely love the built-in-wall coffee maker. It will help you make these beverages as if you ordered one from your favorite coffee shop. Cappuccino – consisting of two thirds milk froth and a third espresso. Latte macchiato – consisting of a third hot milk, a third milk froth and a third espresso. Caffè latte – consisting of hot milk and coffee. You can put milk in the flask if you are planning to make drinks with milk for the day. But if you are not using milk for a long time, it’s best to return it inside the refrigerator. The milk flask cannot keep the milk cool for a long time. The optimum milk temperature for frothing is set at 13 degrees Celsius. Also, avoid milk with additives. Use fresh milk only. With a built-in-wall coffee maker, you can create a profile and set preferences to make coffee just the way you like it. Change drinking parameters – On the menu, you can alter your preferences and set a personal profile that you can click and it will brew coffee depending on the settings you have saved. 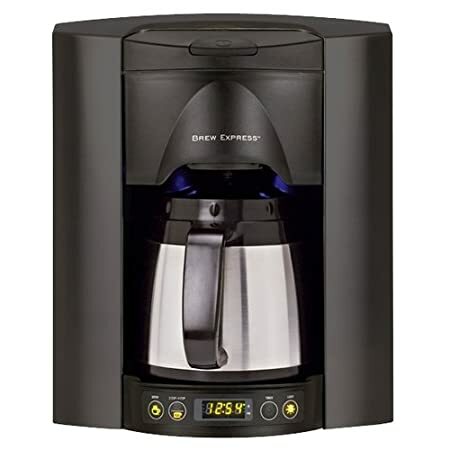 You can change the amount coffee, temperature and brewing options. Changing the brewing temperature – Brewing temperature can change depending on the type of coffee, whether you are creating espresso or coffee; and your altitude. If you leave in a higher area, you may need to lower the temperature because water boils easily at a higher ground than at sea level. If you have set your heart, mind and money to buy a built-in-wall coffee makers, here are the best recommendations from experts. The Thermador TCM24RS is highly programmable with over 10 different beverages to choose from. Have the luxury of making gourmet coffee in the comforts of your home, right in your kitchen. From a single shot espresso to latte macchiato, entertain your guests with their favorite coffee flavor and put your best barista mode on. Miele is a favorite kitchen brand because of its elegant and contemporary designs. It’s line of built-in-wall coffee maker is no exception. 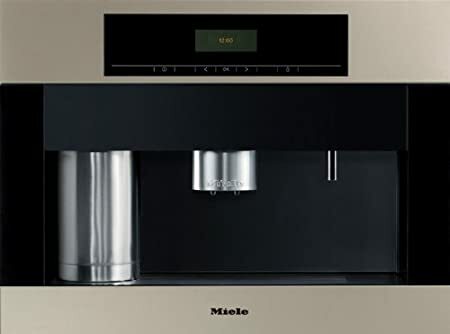 The Miele 24” is a popular choice for homes who want to integrate a barista-style coffee making system. It can hold up to 84.5 ounces of water. That’s equal to 10 cups of coffee. The built-in-wall coffee maker is perfect for modern homes. If you are planning to remodel your kitchen and install contemporary appliances, consider adding this in your line-up.